As of 16.00 pm on Wednesday, the liquidation of fires in the warehouses of the sixth arsenal of Ukraine's Defense Ministry in Ichnia district, Chernihiv region, was continuing, with pyrotechnic experts demining four settlements in the district, the press service of the State Emergency Service of Ukraine has said. 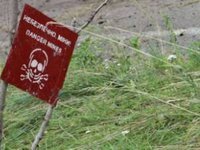 "To carry out work at the scene, 21 pyrotechnic squads totaling 110 persons and 40 pieces of equipment began work on demining four settlements, namely: Ichnia, Avhustivka village, Druzhba village, Hmyrianka village," the service said. Pyrotechnic units responded to 54 reports of explosive objects found by the local population (432 explosive objects). In total, more than 1,000 people and 216 units of equipment, including 260 people and 75 units of equipment and two An-32P aircraft from the State Emergency Service, were involved in rescue and other urgent work in the emergency area. "As of 16.00 on October 10, the State Emergency Service of Ukraine carried out aerial reconnaissance of the technical territory of the arsenal and carried out 15 water discharges (120 tonnes)," the service said. Ukraine's Defense Ministry said that as of 16.30 on the technical territory of the arsenal, there are three engineering vehicles and nine GPM-54 fire tanks, as well as 15 fire trucks from the units involved in fire suppression. Two An-32P airplanes from the State Emergency Service carried out 18 water discharges. In addition, two engineering vehicles, four fire brigades of Ukraine's Armed Forces were involved in extinguishing fires. They used 12 tank trucks of the State Emergency Service to fill them with water. As earlier reported, information about explosions at the sixth arsenal of Ukraine's Defense Ministry was received at 03.30 on Tuesday morning.